Giving English or French books to local people seems sort of stupid at first, but really we are planting seeds, something they need to do already. ANY MEMBER OF HOBO CAN WORK ON THIS PAGE - REQUEST PERMISSION TO EDIT FROM ANDY. Why give an English, French, German, Portuguese book to people in Africa? There is a great map on that wiki page to look at. Yet, this page can not give the true nature of language, for example, inside the USA, the language of English can change from Indiana to New Orleans, whereby I cannot even understand their English, this is what languages do, they pronounce different until they finally call it a different language. Therefore people adopt a language of business. This language for the planet is English, second is French or Spanish, then after that, not really important. Most Chinese people will learn English, but to take businsess into China, or any country, then you learn Chinese, but coming out, they learn English. Africa has 2 major languages of business, English and French, so no matter what local language the children speak, the must learn English or French to become better educated. This is why TEFL, Teaching English is so valuable to locals, they want to learn English so they can prosper. 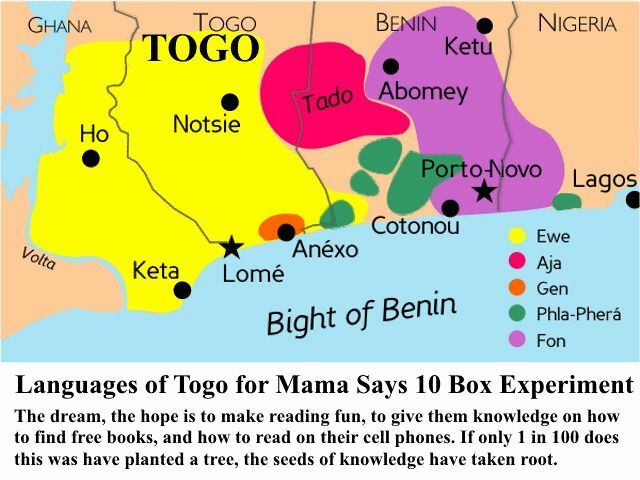 A child must learn English or French in Togo to go to University. And having books that are FUN to read teaches a lot better than school books. Africa does not need boring books of math, they need fun books like John Grisham, so they learn to love to read. I love to read a good book. Lingua Franca is the phrase used to define the language of business. Unfortunately for Americans, we speak the dominant business language. This lack of understanding of language makes Americans lack empathy. Reading my one day end, as everyone is watching you tube, the world does change. I dream that a small boy or girl in Africa, can sit under a tree, and start to read, until he or she is the next Einstein. There is no way to stop a person from learning who has access to free books. The Internet is not free, but soon 99 percent of people on the planet will have cell phones.